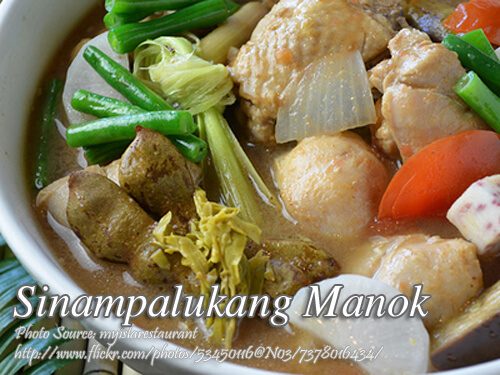 Sinampalukang manok is very similar to sinigang, a sour tamarind based soup but there are other ingredients used to make the soup sour such as guava, kalamansi or unripe mango and the most popular is the pork sinigang. But be reminded that sinampalukang manok is not a variation of sinigang where you have to saute the chicken with the onion, garlic and ginger whereas the sinigang you can put everything in pot and cook it. Sauté garlic, onion, ginger, tomatoes and the chicken pieces. Add patis and water, cover and simmer for about 20 minutes or until the chicken is almost tender. Add the string beans and eggplants, then cover and boil for 3 minutes. Add the young sampaloc leaves, pepper and water. Cover; bring to a boil and correct seasonings. Serve hot. Good for 8 persons.